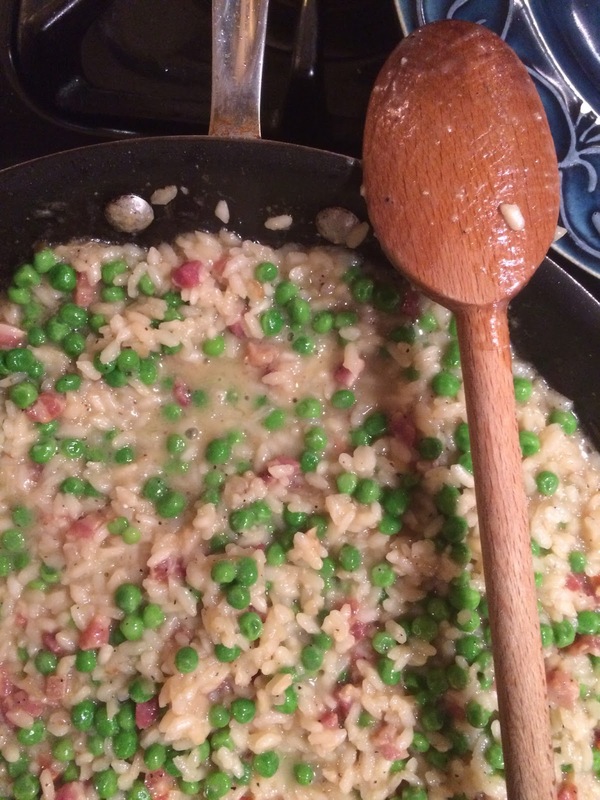 Defrost a box of frozen peas and bring in spring with the help of some creamy bacon goodness. In a small pot boil approximately six cups of chicken stock then turn the heat down to very low. Next, chop a quarter pound of bacon or pancetta into small pieces and sauté in a large pan over medium heat with a bit of oil until crisp, then scoop out the bacon and set aside. Add two finely chopped garlic cloves and a shallot to the bacon fat and cook for a minute before stirring in a cup and a half of Arborio rice. When the rice is coated completely, pour in a half cup of the chicken stock and simmer briskly until the broth is absorbed. Stir well, then pour in another half cup of stock and repeat the process until the rice is al dente, about twenty minutes. In the end you may not have to use all of the stock. While still on the heat stir in the peas, wait a few minutes, then mix well with the bacon, a cup of parmesan, and salt and pepper to taste. Serve immediately with some parmesan garnish.